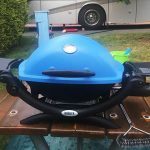 In Which We Discover the Top 3 RV YouTube Channels! We are very excited about plans to buy an RV, and we are working hard on researching and finding out all we can about it. The subject is a lot more complex than we ever imagined, and we have tons of choices to make and shopping to do! We have found lots of great resources on the Internet. In particular, our new form of entertainment is RV videos on YouTube. 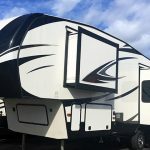 These are the top 3 RV YouTube channels we have found for learning about RVs. RV YouTube Channel no. 1: Loloho – Long, Long Honeymoon. 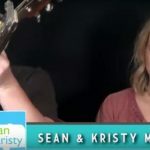 Hit the Road with Sean and Kristy! Maggie and I both love the Loloho YouTube channel. 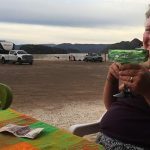 It features Sean and Kristy Michael, a charming, funny, entertaining couple who share their adventures on the road in the USA and Canada, with lots of focused advice for new RVers thrown in. Occasional glimpses of their “guard dog” – a tiny Chihuahua – add to the charm. As do short bursts of Sean enthusiastically playing his guitar, while Kristy rolls her eyes ever so slightly! Sean and Kristy got married in the Florida Keys in 2007, and then set off in a 25-foot Airstream travel trailer to explore America. With the motto that life should be one long honeymoon, their “honeymoon” has now covered over 100,000 miles and 49 states, including Alaska. They also live in houses sometimes, in Alabama and Florida. A great starting point for watching this channel is the Loloho Playlist for Beginners. Sean and Kristy also have a website that is full of interesting stuff. Note: if you do watch Sean and Kristy’s channel and get some good advice on a useful product to buy, try to repay their efforts by clicking through to Amazon to buy the product. I know from experience that it takes DAYS to make even a halfway-good video, so it seems like a polite way to repay the effort they put in to make GREAT videos. When you use an Amazon affiliate link, you pay the same price, while the affiliate gets a small commission for their trouble. This is the reason you seldom see Amazon advertising – their model is affiliate marketing, which to my mind is a more focused, less invasive way of advertising. You get links to what you want, not inducements to buy things you do not want. And the person who took the trouble to find that product and try it out gets a small payment for their trouble. Advertising revenue goes to small businesses, not giant agencies. What’s not to like? 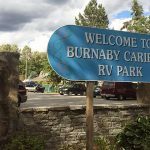 Also, KYD’s video about their Top 10 RV destinations on the West Coast and in Canada is great fun to watch, and gave us lots of ideas for destinations to try one day. By the way, if you are wondering why I keep mentioning production values … you will find out why when you start watching RV videos, and discover how many are really hard to watch, for a variety of reasons, including: loud, annoying music; inaudible commentary; people rambling on for 20 minutes about nothing before they get to the point; beautiful footage with no captions or commentary so you have no idea where it was shot; etc. etc. In any event, Marc and Trish’s YouTube channel has none of those problems! Plus, they travel with three teenagers, which is pretty amazing. When our kids were younger, we found it challenging to share a huge house with three teenage daughters, so I don’t know how they do it. In their earlier days they also had an ageing golden Labrador, Maddie, but sadly, she has moved on to the great RV park in the sky. One of our funniest moments in watching these videos was watching Marc try to persuade Maddie to get in the RV! We still chuckle every time we think about it. I will add a link to this video once I find it again … they have so many great videos, I am battling to find this one again. If you like their channel enough to repay Marc and Trish’s efforts, you can join the YouTube Patreon program and become a KYD sponsor. It’s cheap and you get a lot of cool stuff – check it out here. This YouTube Channel features Olivia and Kyle, yet ANOTHER attractive and entertaining couple who produce great videos about RV life. 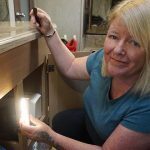 They are different in that they are more serious than funny; they are a younger couple; they live absolutely full time in their RV; they launched their venture as frugally as possible and try to live minimally and deliberately; and they live in a 16-foot trailer. No kids or dogs, fortunately! As you can see, this couple has style! Also, Maggie has been very happy to see that recently, they sometimes take their sunglasses off. If you want to support Olivia and Kyle, check out their Etsy store, where they sell Antique Maps, Prints, Illustrations, and Advertisements, or click on their Amazon affiliate links underneath their videos. 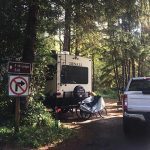 If you are interested in learning about RV living, we strongly recommend you check out these top notch, fun, entertaining, and informative YouTube Channels.